Kenyan mobile device enthusiasts and consumers can now enjoy best-in-class dual camera experience, enhanced stylus pen usage, innovative entertainment and productivity capabilities with the launch of the Galaxy Note8 device in Kenya on October 5, 2017, at Samsung Experience store at ICEA building. The device that was introduced globally in August is a smartphone that pushes the boundaries of phablets with its seamless hardware design and a variety of new service offerings. The Galaxy Note8 is now available in Kenya and brings a new level of functionality and convenience with a much thinner stylus pen, great camera experience, and better performance. The Galaxy Note8 users will enjoy a truly immersive viewing experience without distractions that also enhances the onscreen multi-tasking experience, thanks to the 6.3” infinity display. The design of the Galaxy Note 8 also remains ultra-thin, thanks to the curved edges, allowing for comfortable handling. Since its launch, the S Pen has been the defining feature of the Note series and has helped users unlock unique ways to interact with their devices. The S-pen is now IP68 rated* (water and dust resistant), which enables the use of the S-pen in wet conditions and freshwater bodies that are 1.5m deep for up to 30 minutes. The S-pen is also now equipped with a thinner tip and enhanced pressure sensitivity making the writing and drawing experience on the Note8 more precise. 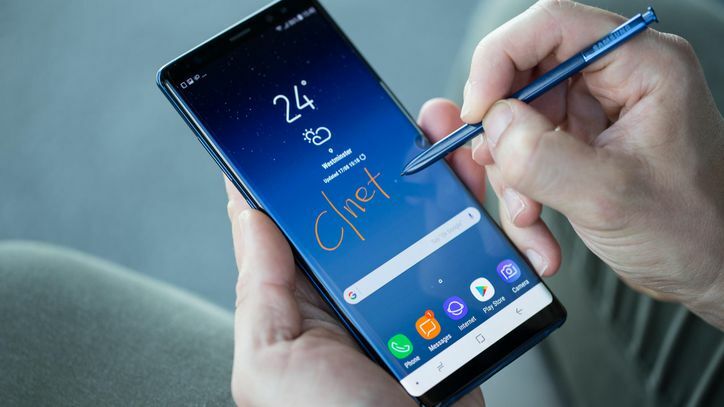 With the Galaxy Note8, the S Pen takes things a step further incorporating a fun Live Message feature, improved Screen off memo capabilities and enhanced Translate functionality. The refined S Pen enables users to express themselves in ways that no conventional stylus can. The device packs 6GB of RAM, and a new dual-lens 12MP camera, with dual pixel technology for incredibly fast autofocus and wide F1.7 aperture for vivid and bright photos even in low light conditions. The front 8MP camera also features a wide F1.7 aperture and Selective focus for enhanced selfies. The advanced dual lens camera features one wide-angle lens and one telephoto lens each with 12MP allowing users to control the depth of field in their shots to create stunning portraits and photo scenes. The rear camera also features 2x optical zoom on the tele photo lens and improved digital zoom on the wide angle lens. Both lenses also feature Dual optical image stabilization making the Note 8 the world’s first mobile device that incorporates optical image stabilization on a dual lens camera. The Note 8 is powered by an advanced 10nm processor and comes with 64GB internal memory, expandable up to 256GB via Micro SD slot. In re-defining how users interact with their smartphone, Samsung introduced Bixby with the Galaxy S8. This intelligent interface helps users get more out of their phone and is also available in the Note 8. Contextual awareness capabilities enable Bixby to offer personalized help based on what it continues to learn about the user’s interests, situation, and location. Users can also shop, search for images and get details about nearby places with Bixby’s image recognition technology. Additionally, with the Galaxy Note 8, Bixby Voice assistant features will now be available with the feature rolling out to the S8 as well via a software update soon after. As the Bixby ecosystem grows, it will connect across devices, apps, and services as a ubiquitous interface, and open up new experiences and scenarios to simplify life. The devices are available at Samsung Experience Store, Safaricom shops, Fonexpress, Naivacom, Tuscom shops and authorized dealers countrywide.